Click on the picture above for a demonstration of a typical MIB display. Fixate the center circles while attending to the yellow circle in the upper left quadrant of the display. You will find that the yellow circle will begin to fluctuate in and out of awareness. Perhaps the most striking phenomenon of visual awareness to be discovered in the last decade is that of motion-induced blindness (MIB). In MIB, completely visible objects will repeatedly fluctuate into and out of conscious awareness when surrounded by certain global moving patterns. Although commonly characterized as a lapse in visual awareness, I proposed that MIB reflects an adapted function of the visual system which identifies and compensates for blind spots caused by injury or disease (New & Scholl, 2008, Psychological Science). While blind spots (termed scotomas) could be distracting and dangerous, they’re often not even noticed due to a clever heuristic – blind spots can be identified by their failure to change with respect to the visual field around them. Since these ‘spots’ aren’t in the world at all, but are instead spurious artifacts within the visual system itself, they are ‘filled in’ based on their surrounding input. MIB displays similarly activate this mechanism for filtering out potentially spurious percepts from visual awareness. Click on the picture above for a demonstration. 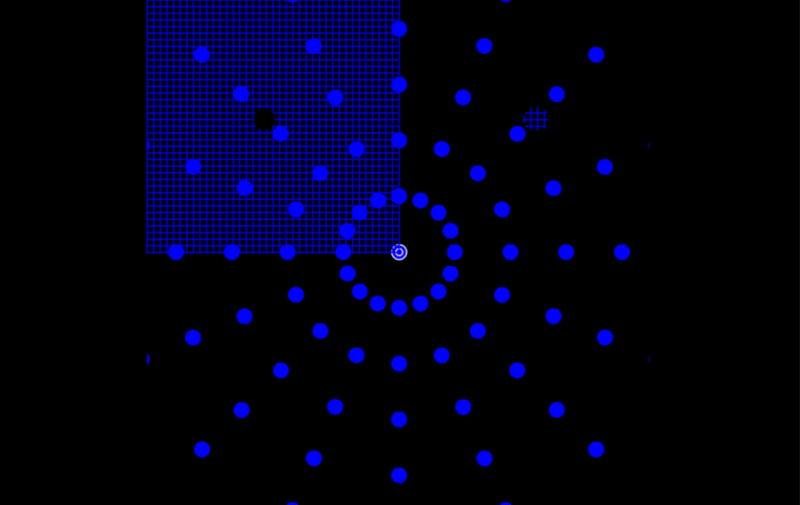 Fixate the center circles while attending to the hole in the center of the blue grid. In MIB displays, a single discrete object disappears on a simple background. However, the function of MIB for filliing in blind spots should be capable of interpolating complex information from the surrounding region. In this display you should find that the hole in the upper left grid will now 'disappear'. This is made possible by filling in the inferred blind spot with the surround grid pattern. The perceptual scotoma theory does not require motion, but requires only some global change. Therefore, an object that fails to change with respect to global luminance is more likely to be a visual defect than an object in the outside world. 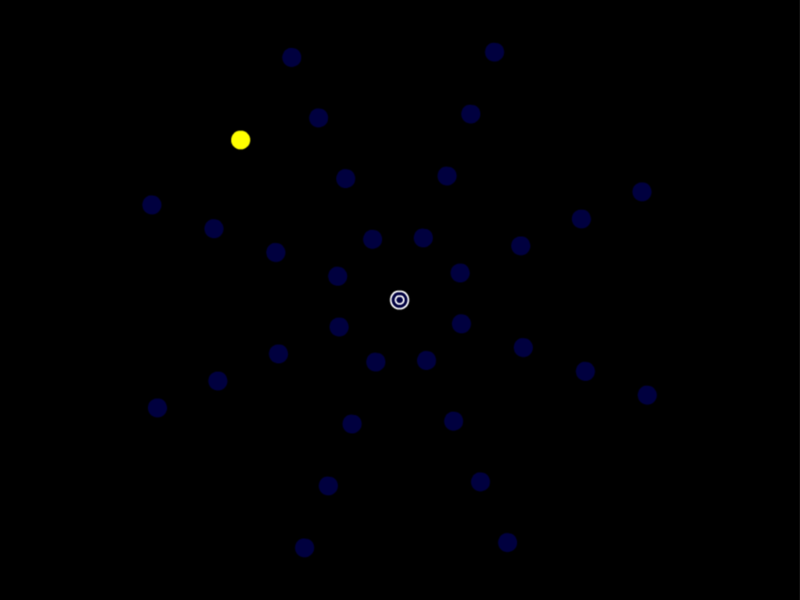 In this display you should find that the yellow circle in the upper left grid will fluctuate in and out of awareness - even though the background objects are not moving but only cycling in luminance. As an adaptive problem, scotomas are not always simply opaque spots but instead distort regions of the visual field. Scotomas can cause a reduction in luminance, spatial distortions, or color alterations. The perceptual scotoma account anticipates that these other manners of visual field defects will also be compensated for, despite their continual activity. In MIB displays, the simulation of these distortions can also fluctuate in and out of awareness. Click on any of the pictures above for demonstrations of each type of simulated scotoma. Fixate the center red square circles while attending to the distortion in the upper left quadrant of the display. Fixate the center circles while attending to the yellow circle oscillating in the upper left quadrant of the display. The perceptual scotoma account may even apply to a kind of moving blindspot. The eye itself is akin to a ‘snow globe’ in that all sorts of detritus can be suspended within the eyes themselves — e.g. collagen fibrills or red blood cells. These irregular masses can produce focal opacities that float around, lurch with eye movements, and most critically commonly appear to drift downwards during fixation. As such, the perceptual scotoma hypothesis predicts that the direction of slowly moving targets may also be weakly diagnostic for whether a bit of local stimulation is in the world or in the eye. As predicted, targets were more susceptible to motion-induced disappearances when drifting down than when moving upwards, equating for absolute position in the visual field. New, J., & Scholl, B. (2008). 'Perceptual scotomas': A functional account of motion-induced blindness. Psychological Science, 19, 653-659. (PDF).